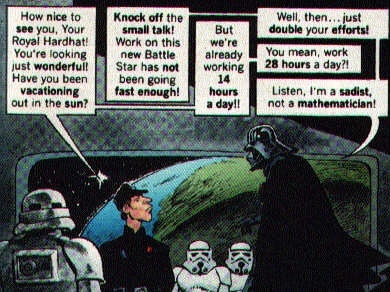 Do mathematicians have jobs in Star Wars? I'm an aspiring Mathematician i.e. a pure/applied math major with a minor in comp sci and econ. I'm sure you star-wars fans (at least I do) fantasize what it would be like if I existed in the Star-Wars Universe. Usually I imagine being someone else, i.e. I imagine being a jedi, sith or bounty hunter. But this time I considered what if I existed in the Star Wars Universe and I was me, an aspiring mathematician. Do mathematicians even exist in Star Wars? I'm under the impression all technical jobs in Star Wars are interested solely in Technology (Engineering) and Hacking (Comp. Sci). Mathematitians definitely have their place in Star Wars galaxy - ironically, in capacities similar to today's earth. The biggest single employer for mathematicians today is No Such Agency National Security Agency. It employs mathematicians - to put it in layman crude terms - as code makers and code breakers. In Star Wars, the same exact thing happens in canon: the new Disney canon book "Star Wars: Heir to the Jedi" has Drusil, a member of mathematically inclined Givin specis. The central plot revolves around Empire trying to get her to break Rebel Alliance codes, and Rebels trying to save her from Imperials to do the reverse. Other mathematically inclined people get snapped up by more of an applied side of things, to become quants for financial companies and build financial models. In Star Wars, enter mathematically inclined Muuns, who were prominent in banking. They founded InterGalactic Banking Clan (source: AotC and CW) as well as served as a kind-of-Federal-Reseve, backing Galactic Credit (source: "Darth Plagueis" book, EU/Legends canon). Many statistically inclined mathematicians end up doing actuarial work, especially for insurance companies. In Star Wars, we have no less than five known insurance companies. Makes sense, with all the risks. Funny that you should ask this now, I just finished reading X-Wing: Mercy Kill which deals with a Mathematician feeling out of place. A Gamorrean male named Voort "Piggy" saBinring is a professor of mathematics at a University on some planet. "I'm a math instructor now. I take mathematical concepts, I shape them into spikes, and I spend months hammering them into the heads of students who's much rather be involved in amorous pursuits or playing games,..." So there are for sure professors and students of mathematics. So there is a need for living professors rather than just having droids do the teaching, "'A teacher droid can do everything you're doing for your students...' 'A droid can't instill into them a love for mathematics'". Chapter 2 page 30ish. As for real world job applications for mathematicians, especially with minors in comp sci., I believe there would be even more opportunities, not less. Don't underestimate the practical applications of Mathematics. I'm a computer Engineer, so not that different from your educational background, and I see math EVERYWHERE. There's not a day that goes by where I don't use calculus, or at least some form of math, in technical designs. We often use mathematicians as consultants for some of the more complex problems. IMO in a world full of starships, droids, and battle stations, mathematicians would never be out of the job. There are also countless examples of scientists/mathematicians in many SW video games. They usually design advanced technologies however. As a side note, Engineers often work side by side with mathematicians and other scientists in the real world. What continuity problems have Star Wars: The Clone Wars created? Which wars are “Star Wars”? Why is Star Wars named Star Wars? Do any Star Wars planets have multiple settlements/cities? Have bricks been invented in the Star Wars universe?